INTech has hosted several camps in Charlotte, as well as numerous cities in South Carolina and California, and held its first camp at NC State in June. Several current students from and recent graduates of the Department of Computer Science volunteered to work the camp. A group of 25 girls were told to divide into teams and pick a social topic that interested them. They spent the week learning to code a website that would share information on their topic. When they weren’t coding, the students were touring Triangle technology giant SAS, meeting with engineers from Microsoft and Fidelity Investments and listening to a panel discussion featuring local women working in the technology field. Braswell, who works on user experience for enterprise applications at Apple, Inc., took computer science classes in the same Daniels Hall classroom in which the students worked on their websites. “It’s full circle,” she said. Braswell didn’t have a chance to attend a coding camp as a young student. Instead, she first learned about coding by altering her MySpace social media page. From there, she attended Phillip O. Berry Academy of Technology in Charlotte and became involved with Black Data Processing Associates, a national organization working to increase participation by African Americans and other underrepresented minorities in science, technology, engineering and mathematics (STEM) fields. Dr. Brittany Johnson, a recent Ph.D. graduate in computer science at NC State who volunteered at the camp, began learning to code in high school. A native of Sumter, S.C., Johnson earned an undergraduate degree at the College of Charleston before pursuing a graduate degree at NC State. 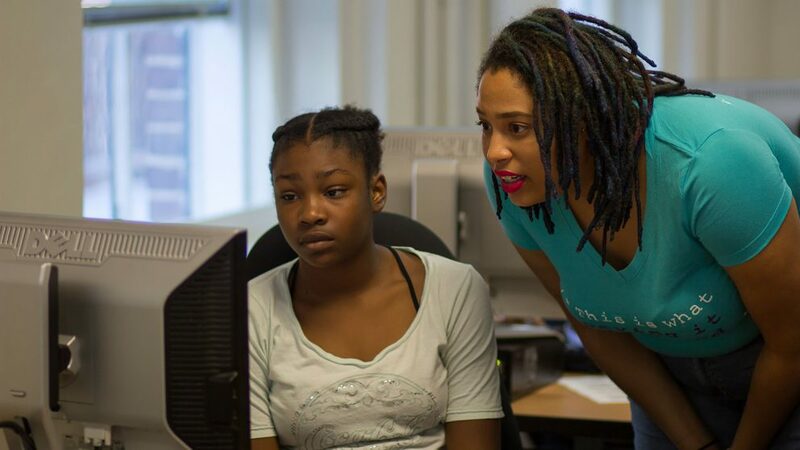 During a break from providing hands-on instruction to campers during a morning coding session, Johnson said the girls are being exposed to coding at just the right time. Johnson said that as a young student she never had a chance to attend a coding camp and didn’t have access to any role models in STEM fields who looked like her. That won’t be the case for Brooke Davenport, who came to Raleigh from her home in Norristown, Penn. to attend the INTech camp. Davenport, a rising eighth-grader, took a computer class in sixth grade with Tech Talent South at HQ Raleigh and has attended a camp focused on creating computer games. Working with a partner on a website focused on the problem of poverty in America, Davenport summed up the fun she was having at camp. “I like that I get to make stuff,” she said.